Walking for God: T.J.Schumer, self-described "former Christian atheist,"
The Biblical admonishment to take up a cross and follow Jesus has a literal meaning for one Oklahoma man. 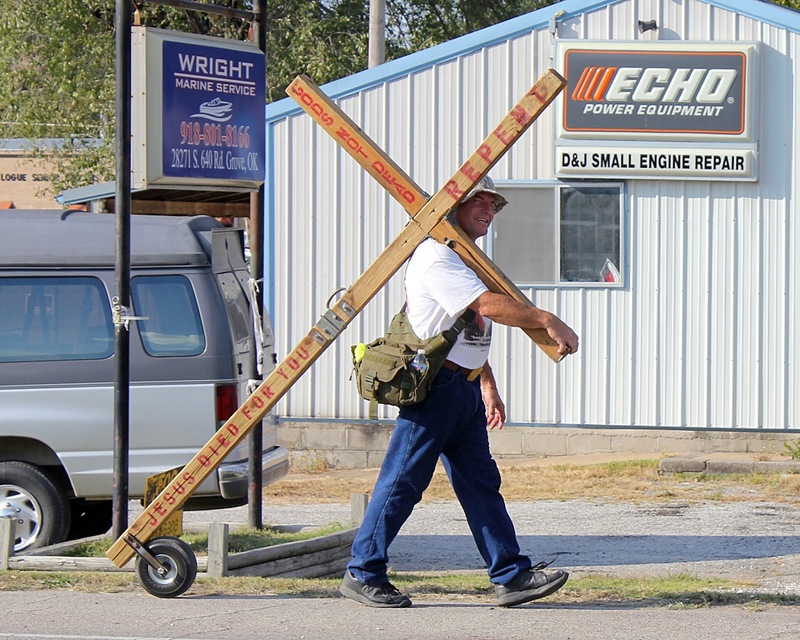 For the past year, T.J. Schumer has "taken up" a nine-foot long, 50 pound wooden cross, and used it to start faith conversations in a variety of Oklahoma, Kansas and Minnesota towns. Schumer, who lives in Inola and works in Tulsa, said he spends at least two days each week traveling to various towns. 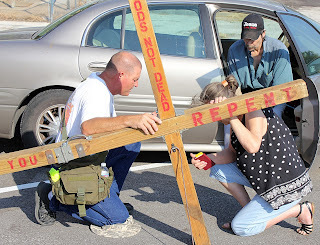 Once there, he unfolds the cross and begins to walk along major thoroughfares of each community. On Tuesday, Sept. 29, Schumer spent the day walking through the streets of Grove, stopping to talk or pray with people as the situation arose. Schumer describes himself as a a "former Christian atheist." A Christian for many years, he said two years ago, upon his 50th birthday, he decided to make some changes in life. He decided to focus less on worldly items and instead find a way to reach unbelievers - or believers needing some encouragement. Through these efforts, his cross ministry was born. "I see this as a tool, a very effective tool, that lets me reach out to people who are lost and hurting." He strives to encourage believers to reach out to others, who may need salvation, encouraging them to "grow the kingdom by bringing God glory." "I see myself as a seed sewer," Schumer said. "I will never force my beliefs. "I'm just done playing games. I want to live life for God." Tuesday's visit to Grove was the first time Schumer said he found himself in this portion of northeast Oklahoma. During the visit he had the opportunity to pray with at least two different groups of people. After praying with people, Schumer presents people with a small New Testament Bible, provided through his work as a member of Gideon's International. He asks people to read the New Testament to seek out the truth's found in the Bible. Schumer likens those meetings as divine appointments. He said they range from people seeking out prayer, to those who need someone who listen to their concerns. In one town, Schumer found himself providing encouragement and hope to a man contemplating suicide. "He had just quit his job, moved to another state to help with his mother who had dementia," Schumer said. "His sister had robbed his mother's bank account and then his wife filed for divorce. "If nothing else, that day, I helped save a man from committing suicide." For now, Schumer's ministry has been limited to his travels in the midwest. He dreams of taking the cross overseas, to share the gospel with people who "have never known the Bible." Schumer said he hopes to continue his cross ministry for the rest of his life. He said his wife, Anita, of 26-1/2 years, supports his ministry. "My plan is to not let this be a phase or to quit," Schumer said, adding that he sees the ministry as a way to live out the message of Matthew 6:19 - to "store treasurers in heaven." "I hope people see me and the cross, their minds and hearts will go back to what the cross means," Schumer said. "I hope it will cause them to reflect upon their lives and truly seek out God." This story originally appeared in the Friday, Oct. 2, issue of the Grove Sun.